Discover your voice and improve your classical music singing skills! You'll learn how to use your body to improve your breathing, giving you freedom to sing many kinds of songs, such as Opera arias, Italian art songs, German art songs, English Baroque music, Musical songs, Russian art songs and more. Beginners to advanced, all motivated singers are welcome! If you have a song list which you would like to sing, just bring it! If you are planning to take an exam such as RCM or any competitions, just talk to me! My students always leave with good results! At the first lesson, I would like to hear your singing voice, and we can discuss your goals. 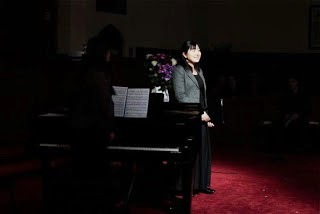 I organize two or three concerts for my singing students each year. (If you prefer/need more, it is certainly possible). These opportunities give you to prepare how to perform in public and you can also learn stage manner. Of course it gives you a chance to invite your family and friends and entertain them with your music! There are also opportunities to perform duets or solo performances. You can also sing with our voice ensemble if you wish, which is a great opportunity to learn to make harmony with other singers. Minimum 1 hour, based on once a week.